What will the 2018 iPhones be called? There are enough potential names for the next iPhone that we could write a whole article just about that! Tell us which you prefer in the poll below. We expect the 2018 iPhones to be unveiled in September. This would be one year after the iPhone 8 launched, and fits Apple's usual release calendar. Mind you, in 2017 the company didn't launch all of its new phones at the same time: the X arrived one month after the 8 and 8 Plus. Is it likely that the new iPhones will have different launch dates in 2018? Probably not. A Korean report in June claimed that the cheaper model wouldn't arrive until November, but most analysts now believe production plans are back on schedule. 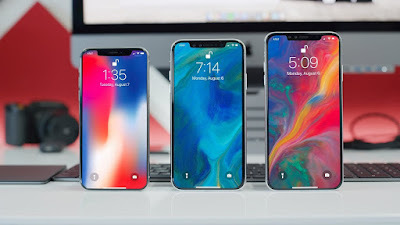 Ming-Chi Kuo, for instance, says Apple is focused on ensuring all the new models are ready to meet the same shipping date, and claims that despite entering mass production later than the other models, the 6.1-inch LCD iPhone will hit stores at the same time. How many new iPhones will Apple launch in 2018? Most reports point to three. 5.8in OLED: the successor to the iPhone X, with largely same design. 6.5in OLED: a Plus version of the iPhone X, aka iPhone X Plus or XI Plus. 6.1in LCD: a cheaper iPhone with the same design as the X but slightly larger bezels ad an LCD display. It will feature Face ID but not 3D Touch and won't have twin camera lenses on the rear. There is some disagreement about the size of the largest model; an Olixar leak backs up the 6.5in measurement above, but Nikkei, citing "a source privy to the company's product designs", argues that it will be 6.3in. We think that's pushing it for a single event. The iPhone X was positioned by Apple as a premium iPhone with a premium price - starting at £999/$999, while the iPhone 8 and 8 Plus were priced at £699/$699 and £799/$799. Will the 2018 models follow suit? Respected analyst Ming-Chi Kuo's first research note since departing KGI Securities in April suggested that Apple will be offering a "more aggressive" pricing strategy this year. 5.8in "iPhone X" will be $800-$900 (down from $999). 6.5in "iPhone X Plus" will cost $900-$1,000. 6.1in LCD model will be $600-$700. In terms of UK pricing, rather than doing a straight currency conversion, which wouldn't include VAT, it is generally more accurate (at least with iPhones) to switch the dollar signs to pounds - so that's £900-£1,000 for the Plus handset, £800-£900 for the X successor, and £600-£700 for the LCD.